An image of an Old World fruit fly, Drosophila subobscura, is superimposed over chromosomes from the species. 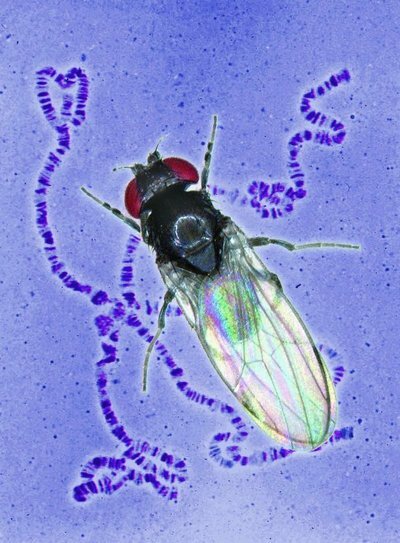 Fast-warming climate appears to be triggering genetic changes in a species of fruit fly that is native to Europe and was introduced into North and South America about 25 years ago. “This is a clear signal on three different continents that climate change is occurring, and that genetic change is going along with it,” said Raymond Huey, a University of Washington biology professor who is co-author of a paper describing the findings, published Aug. 31 in Science Express, the online edition of the journal Science. The research deals with an Old World fruit fly species called Drosophila subobscura, which originally ranged from the Mediterranean Sea to Scandinavia. European biologists who studied the insect’s genetic makeup more than 40 years ago noted that sections of chromosomes were inverted, something like taking part of a bar code from a consumer product and flipping it backwards. The biologists found that the frequency of particular inversions was correlated with the latitude where a given insect was found. Inversions that were common in the north were uncommon in the south, and vice versa. The fruit flies were accidentally introduced to the Pacific Coast of Chile in the late 1970s and to the North American West Coast in the early 1980s, probably on cargo ships. They spread rapidly, and in North America they are now found from near Santa Barbara, Calif., to northern Vancouver Island in British Columbia. The first samples of chromosome inversions were collected at several sites in Europe three to four decades ago, and the same sites were sampled again recently. South American flies were sampled for chromosome inversions in 1981 and again in 1999. In North America, the first samples were collected in 1985 and the most recent came in 2004. The scientists also looked at shifts in weather patterns during the intervals between sample collections. At nearly all sites, temperatures had increased consistent with global warming. “If the inversions are sensitive to temperature, then you’d expect to see a corresponding increase in low-latitude-type inversions at all latitudes,” Huey said. When the researchers compared the old and new samples, they found the genetic composition of the flies showed an increased frequency of low-latitude inversions. The implication, Huey said, is that the chromosome inversions common in low latitudes seemingly provide the flies with protection against warmer temperatures. The genetic composition found in the newest samples corresponded almost exactly to the composition of insects that in earlier studies were collected from sites 70 miles, or 1 degree of latitude, closer to the equator. That means fruit flies collected in Milwaukee, for example, would show the same frequency of chromosome inversions as those found 70 miles farther south, in Chicago, decades earlier. The effects were similar on all three continents. The painstaking work of counting inversions was done in a genetics laboratory at the University of Barcelona in Spain. Joan Balanyá from the University of Barcelona is the lead author, and other co-authors are Luis Serra and Josep Oller from Barcelona and George Gilchrist from the College of William and Mary in Virginia. The work was supported by grants from Spain’s Dirección General de Investigación del Ministerio de Ciencia y Tecnología and the Comisión Conjunta Hispano-Norteamericana de Cooperación Científicia y Tecnológia, and from the National Science Foundation. In the paper, the researchers note that “the genetic shift is remarkably rapid and is detectable even for samples separated by fewer than two decades.” They add that such rapid genetic changes are likely to occur much more quickly in organisms with short life spans, such as a fruit fly, which can produce several generations in a single year. “In the long term, this suggests that climate warming is already having genetic effects, at least on these organisms,” Huey said. “The good news is that these flies may be able to adapt, at least to some extent, to a warming climate. However, organisms with longer intervals between new generations, humans or sequoia trees for example, probably can’t adapt nearly as readily.